Enabling waste heat recovery projects worldwide. By definition, heat is thermal energy transferred from one thing to another. And like other forms of energy, heat can be used to perform work. It can warm things up, cool things down, generate electricity, and be transmitted for use in different locations. It is below us, in the earth as geothermal energy. It's above us, radiating from the sun as solar thermal energy. And it's a byproduct of so many of our small and large industrial processes. The combustion of a car's engine produces heat, as does the large generator that powers the grid. So does the factory producing cement, or glass, or steel. Unfortunately, most of the heat that is produced in the world as a byproduct of a process is simply vented into the atmosphere. This is where we get the term "waste heat", and there's a lot of it. The US Department of Energy estimates that 20-50% of industrial energy input is lost as waste heat, and 60% of the primary energy used in power plants becomes waste heat. Heat can be collected and put to beneficial use where a heat demand is nearby. A common form of heat utilization is Combined Heat and Power (CHP) whereby heat from a power generation facility is captured and used for something like heating a building, pool, or greenhouse. It sounds counterintuitive, but heat can actually generate refrigeration or cooling. For example, a hospital that combusts used equipment could use the hot exhausts to create cooling for refrigeration used in the same facility. Heat can be converted into electricity in a variety of ways. In each, the conversion process requires no additional fuel and produces no additional emissions. In that way, it is similar to solar or wind, but it has the potential benefit of operating 24 hours per day rain or shine... as long as the heat source is operating. Heat, sometimes called thermal energy, is the transfer of energy from object to another. We say that an object is "heating up" or "cooling down" when heat is added to or removed from an object. Applying heat to an object can do one of two things: increase the temperature or change the phase of the material (say from water to steam). These two situations are explained further in Types of Heat. Temperature, on the other hand, is the motion of atoms and molecules, either vibrating or moving around so that they bump into each other. Temperature is a quantitative measurement of that microscopic motion. The more molecular motion, the higher the temperature. Theoretically, there is no maximum temperature, but there is a minimum temperature (absolute zero) at which point the molecules in the object stop moving altogether. An object or fluid flow does not "have heat". Remember, heat only exists as a transfer of energy, so an object cannot possess heat by itself. Usually when we say "how much heat is available" we are really saying "how much heat would be available if we were to reduce the temperature of this object to a certain point". The lower temperature you allow, the more heat you can extract. When we talk about heat, we usually will mention the amount of heat and the highest temperature. The Calculator we built in-house takes care of all of the details in the calculation to provide you with a quick answer and quantifies some of the ways you can use the heat. Try it out here. Conduction: direct transfer through a material (e.g. outside of a coffee mug gets hot due to conduction). This usually refers to heat transfer through a solid. Convection: the process of heat transfer from one location to the next by the movement of fluids or air (e.g. a forced air heating system distributing warm air through convection). Radiation: transfer of heat by means of electromagnetic waves. (e.g. how the sun warms the earth). These are the fundamental principals for understanding how heat can be captured, transferred to different locations and/or machinery, and used to perform a desired type of work (heating, cooling, power generation). A site called the Physics Classroom describes the types of heat transfer in more detail - click to open their page. Sensible heat: heat transfer in which the temperature of an object changes. For example, as you heat up a pot of water, the temperature increases. 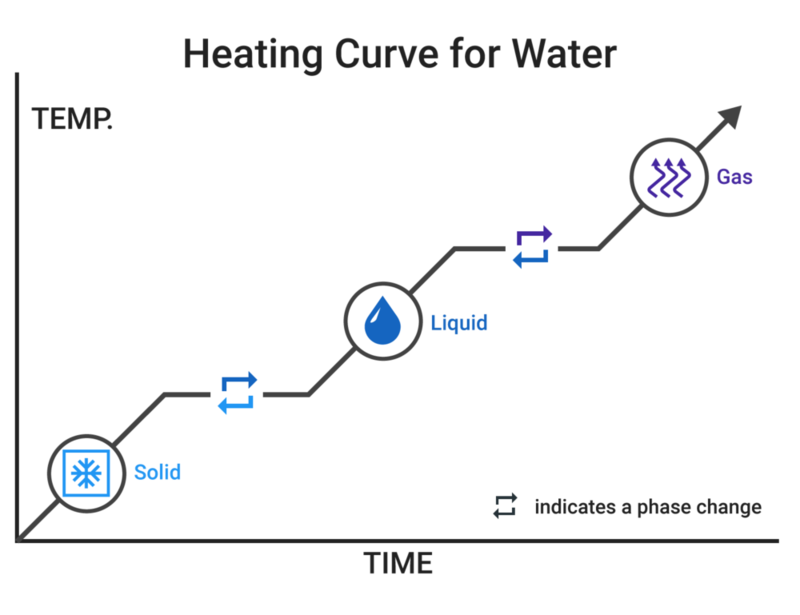 The chart to the right shows the heating curve for water. Look at the sloped portion for water and imagine putting a pot of water on the stove. The water will heat up over time until it starts to boil. The flat portion represents boiling, where the temperature stays the same (100C 212F) but the water is getting turned into gas. Sensible and latent heat are important to understanding the internal workings of heat utilization equipment, and in particular for estimating the quantity of heat available in steam. But don't worry, our Calculator takes care of that. Now that you have a basic understanding of what heat is, and what we can do with it, check out our section on Heat recovery. All rights reserved. This website is provided “as is” without any representations or warranties, express or implied.